Berlin is the capital city and one of the 16 states of the Federal Republic of Germany. Located in northeastern Germany, it is the center of the Berlin-Brandenburg metropolitan area, comprising 4.9 million people from over 180 nations. Berlin was successively the capital of the Kingdom of Prussia (1701-1918), the German Empire (1871-1918), the Weimar Republic (1919-1933) and the Third Reich (1933-1945). After World War II, the city was divided; East Berlin became the capital of East Germany while West Berlin became a Western enclave, surrounded by the Berlin Wall from 1961-1989. Following the reunification of Germany in 1990, the city regained its status as the capital of all Germany. Berlin is a center in European politics, culture, media, and science. The metropolis is home to world-renowned universities, research institutes, sporting events, orchestras, museums and personalities. Recognized for its festivals, contemporary architecture, nightlife and avant-garde arts, Berlin has evolved into a focal point for individuals attracted by liberal lifestyle, and modern zeitgeist ("spirit of the times"). As capital of affluent and technologically powerful Germany, the economy of which is the fifth largest in the world, and with Cold War issues in the past, Berlin can only be expected to prosper. Potsdam on the River Havel, southwest of Berlin. It is a part of the Metropolitan area Berlin/Brandenburg. The name Berlin may derive from the old (West Slavic) Polabian stem berl- or birl- meaning "swamp." Berlin is located in eastern Germany, about 44 miles (70km) west of the border with Poland in an area with marshy terrain. Berlin's landscape was shaped by ice sheets during the last Ice Age. The city center lies along the river Spree in the Berlin-Warsaw Urstromtal (ancient river valley), formed by water flowing from melting ice sheets. 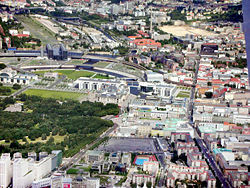 Substantial parts of present-day Berlin extend onto the low plateaus on both sides of the Spree Valley. Large parts of the boroughs Reinickendorf and Pankow lie on the Barnim plateau, while most of the boroughs Charlottenburg-Wilmersdorf, Steglitz-Zehlendorf, Tempelhof-Schöneberg, and Neukölln lie on the Teltow plateau. The borough of Spandau lies partly within the Berlin Urstromtal and partly on the Nauen Plain, which stretches to the west of Berlin. The highest elevations in Berlin are the Teufelsberg and the Müggelberge, both of which have an elevation of about 377 feet (115 meters). The Teufelsberg is a pile of rubble from the ruins of World War II. Berlin has a temperate/mesothermal climate. The warmest months are June, July, and August, with mean temperatures of 62.1°F to 64.2°F (16.7°C to 17.9°C). The coldest are December, January, and February, with mean temperatures of 31.3°F to 34.2°F (−0.4 to 1.2°C). Berlin's built-up area creates a microclimate, with heat stored by the city's buildings. Temperatures can be 7.2°F (4°C) higher than in the surrounding areas. The mean annual precipitation totals 22.8 inches (578mm). In Spandau, Berlin's westernmost borough, the Spree meets the river Havel, which flows from north to south through western Berlin. The course of the Havel is more like a chain of lakes, the largest being the Tegeler See and Großer Wannsee. A series of lakes also feeds into the upper Spree, which flows through the Großer Müggelsee in eastern Berlin. Berlin was devastated by bombing raids during World War II and many of the old buildings that escaped the bombs were eradicated in the 1950s and 1960s, in both West and East Berlin, in programs to build new residential or business quarters and main roads. Berlin's unique recent history has left the city with an eclectic array of architecture and sights. In the eastern part, many Plattenbauten can be found, reminders of Eastern Bloc ambitions to create complete residential areas with fixed ratios of shops, kindergartens and schools. Another difference between former east and west is in the design of little red and green men on pedestrian crossing lights ("Ampelmännchen" in German). The eastern Ampelmännchen design is now used in the western part of the city as well. Frederick II of Prussia was one of Europe's enlightened monarchs. Red Army soldiers raising the Soviet flag over the roof of the Reichstag on May 2, 1945. 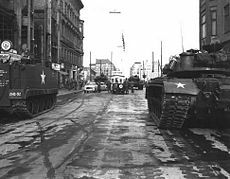 Soviet tanks face U.S. tanks at Checkpoint Charlie. 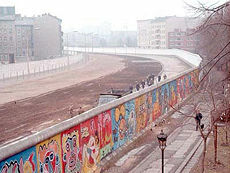 The Berlin Wall in 1986, painted on the western side. People crossing the so-called death strip on the eastern side were at risk of being shot. What was to become Berlin was well outside the frontiers of the Roman Empire, and was inhabited by Germanic tribes. About 720 C.E., two Slavic tribes settled in the Berlin region—The Hevelli settled on the river Havel in Brandenburg, while the Sprevane settled close to the river Spree in today's district of Berlin-Köpenick. About 750, The Hevelli founded Spandow (today's Spandau). In the early ninth century, "Berolina" was the name recorded in a Latin document of a small town in the region surrounded with a stockade, on a trade route linking southern Europe with the Baltic Sea. In 948, Emperor Otto I the Great established German control over the now largely Slavic inhabitants of the area and founded the dioceses of Havelberg, and Brandenburg. The suburb of Spandau is first mentioned in 1197, and Köpenick in 1209, though these areas did not join Berlin until 1920. The central part of Berlin can be traced back to two towns: Cölln (on the Fisher Island) is first mentioned in a 1237 document, and Berlin in one from 1244. The two cities formed an economic and social unit. In 1307, the two cities were united politically, and, over time, came to be known simply as Berlin, the name of the larger of the pair. In 1415 Frederick I became the elector of the Margraviate of Brandenburg, which he ruled until 1440. His successor, Frederick II, established Berlin as capital of the margraviate, and subsequent members of the Hohenzollern family ruled from there until 1918, as electors of Brandenburg, as kings of Prussia, and finally as German emperors. In 1448, citizens rebelled against the construction of a new royal palace by Frederick II Irontooth, and lost many political and economic privileges. In 1451, Berlin became the royal residence, and had to give up its status as a free Hanseatic city. In 1539, the electors and the city officially became Lutheran. The Thirty Years' War, between 1618 and 1648, resulted in damage to one third of Berlin's houses, and the loss of half the city's population. Frederick William, known as the “Great Elector,” who had succeeded his father in 1640, promoted immigration and religious tolerance. With the Edict of Potsdam in 1685, Frederick William offered asylum to the French Huguenots. More than 15,000 Huguenots went to Brandenburg, of whom 6,000 settled in Berlin. By 1700, approximately 20 percent of Berlin's residents were French. Many other immigrants came from Bohemia, Poland, and Salzburg. With the coronation of Frederick I in 1701 as king, Berlin became the capital of the Kingdom of Prussia. In 1740, the philosophically-oriented Friedrich II, known as Frederick the Great (1740-1786) came to power, and Berlin became a center of the Enlightenment. Following France's victory in the War of the Fourth Coalition, Napoleon Bonaparte marched into Berlin in 1806, but granted self-government to the city. 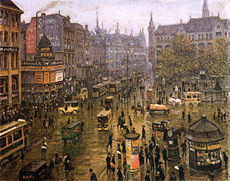 The Industrial Revolution transformed Berlin during the nineteenth century; the city's economy and population expanded dramatically, and it became the main rail hub and economic center of Germany. Additional suburbs soon developed. In 1861, outlying suburbs including Wedding, Moabit, and several others were incorporated. 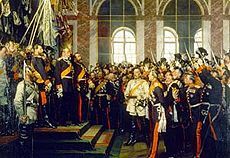 In 1871, Berlin became capital of the newly founded German Empire. At the end of World War I in 1918, the Weimar Republic was proclaimed. In 1920, the Greater Berlin Act united dozens of suburban cities, villages, and estates into a greatly expanded city and established Berlin as a separate administrative region. Berlin, then with a population of around four million, was an exciting city known for a liberal subculture, including homosexuals and prostitution, and for its fierce political street fights. Following the 1933 elections, Adolf Hitler and the Nazi Party came to power. Nazi rule destroyed Berlin's Jewish community, which numbered 170,000 before the Nazis came to power. After the pogrom of Kristallnacht in 1938, thousands of the city's German Jews were imprisoned in the nearby Sachsenhausen concentration camp or, in early 1943, were shipped to death camps, such as Auschwitz. Hitler had planned to rebuild Berlin on a massive scale, renaming it "Welthauptstadt Germania"; but apart from the Olympic Stadium, the plan never progressed. Large parts of Berlin were destroyed in the 1943–1945 air raids and during the Battle of Berlin. After the end of World War II in 1945, Berlin received large numbers of refugees from the Eastern provinces. The victorious powers divided the city into four sectors—the United States, the United Kingdom, and France formed West Berlin, while the Soviet sector formed East Berlin. Initially, all four Allies retained shared responsibility for the city. 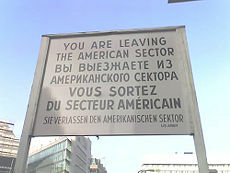 However, the growing political differences between the Western Allies and the Soviet Union led the latter, which controlled the territory surrounding Berlin, to impose an economic blockade of West Berlin. 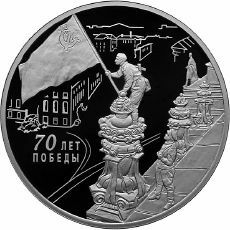 The Allies countered the blockade by airlifting food, fuel, and other supplies, at an increasing rate of up to 5500 tons per day, into the city from June 24, 1948, to May 11, 1949, when the Federal Republic of Germany was founded in West Germany, consisting of the American, British and French zones. Meanwhile, the Marxist-Leninist German Democratic Republic was proclaimed in East Germany. West Berlin remained a free city that was separate from the Federal Republic of Germany. West Berlin was surrounded by East German territory. East Germany proclaimed East Berlin (which it described only as "Berlin") as its capital, a move not recognized by the Western powers. Although half the size and population of West Berlin, it included most of the historic center of the city. The Cold War tensions between east and west culminated in the construction of the Berlin Wall between East and West Berlin and other barriers around West Berlin by East Germany on August 13, 1961, and were exacerbated by a tank stand-off at Checkpoint Charlie on October 27, 1961. West Berlin became a de facto part of West Germany with a unique legal status, while East Berlin was de facto a part of East Germany. It was possible for Westerners to pass from one section to the other only through strictly controlled checkpoints. For most Easterners, travel to West Berlin or West Germany was no longer possible. In 1971, a Four-Power agreement guaranteed access across East Germany to West Berlin and ended the potential for harassment or closure of the routes. In 1989, pressure from the East German population brought a transition to a market-based economy in East Germany, and its citizens gained access across the Berlin Wall on November 9, 1989, which was subsequently mostly demolished. Only a portion of the Wall remains; the East Side Gallery in Friedrichshain near the Oberbaumbrücke over the Spree. 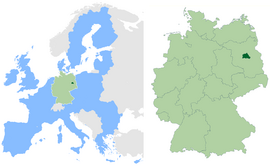 On October 3, 1990, the two parts of Germany were reunified as the Federal Republic of Germany, and Berlin became the German capital. In 1999, the German parliament and government began their work in Berlin. Germany is a federal parliamentary representative democratic republic, whereby the Chancellor is the head of government, and of a pluriform multi-party system. Executive power is exercised by the government. Federal legislative power is vested in both the government and the two chambers of parliament, the Bundestag and Bundesrat. The Reichstag is the site of the German parliament. Map of Berlin's 12 boroughs and their localities. Since German reunification on October 3, 1990, Berlin has been one of the three city states, together with Hamburg and Bremen, among the present 16 states of Germany. Though most of the ministries are seated in Berlin, some of them, as well as some minor departments, are seated in Bonn, the former capital of West Germany. The European Union invests in several projects within the city of Berlin. Infrastructure, education and social programs are co-financed with budgets taken from EU cohesion funds. The city and state parliament is the House of Representatives (Abgeordnetenhaus), which had 141 seats in 2008. Berlin's executive body is the Senate of Berlin (Senat von Berlin), which consists of the Governing Mayor (Regierender Bürgermeister) and up to eight senators holding ministerial positions, one of them holding the title "Mayor" (Bürgermeister) as deputy to the Governing Mayor. The Governing Mayor is simultaneously Lord Mayor of the city (Oberbürgermeister der Stadt) and Prime Minister of the Federal State (Ministerpräsident des Bundeslandes). Berlin is subdivided into 12 boroughs (Bezirke). Each borough is subdivided into a number of localities (Ortsteile), which represent the traditional urbanized areas that inhabitants identify with. The city of Berlin in 2008 consisted of 95 such localities. The localities often consist of a number of city neighborhoods (usually called Kiez in the Berlin dialect) representing small residential areas. Each borough is governed by a borough council (Bezirksamt) consisting of five councilors (Bezirksstadträte) and a borough mayor (Bezirksbürgermeister). The borough council is elected by the borough assembly (Bezirksverordnetenversammlung). 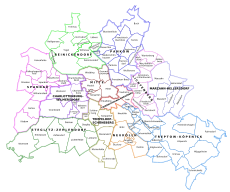 The boroughs of Berlin are not independent municipalities, and are subordinate to the Senate of Berlin. The borough mayors form the Council of Mayors (Rat der Bürgermeister), led by the city's Governing Mayor, which advises the Senate. 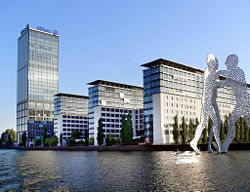 The economy of the city is mainly based on the service sector (Allianz building in Treptow). Berlin was once a major manufacturing center and the economic and financial hub of Germany. It was founded at a point where trade routes crossed the River Spree and quickly became a commercial center. During the early modern period, the city prospered from its role as Prussian capital by manufacturing luxury goods for the Prussian court and supplies for the Prussian military. The city suffered economically during the Cold War, when West Berlin was isolated geographically and East Berlin suffered from poor economic decisions made by East Germany’s socialist central planners. After the reunification of Germany and Berlin in 1990, substantial subsidies were phased out, formerly received by the city of West Berlin. The industrial base of former East Berlin decreased dramatically within a decade, leading to an unemployment rate of almost 20 percent and stagnant GDP growth rates until 2005. In 2006, the nominal GDP of Berlin experienced a growth rate of 1.5 percent (2.7 percent in Germany) and totaled €80.3 ($104.4) billion. Berlin's per capita GDP was $30,252 in 2004. Since 2006, the unemployment rate steadily decreased to 14.9 percent (2007) but remained above the German (8.4 percent) and the EU27 (6.7 percent) average. The arrival of the federal government in 1999 brought some economic stimulus to Berlin. Berlin’s service sectors have also benefited from improved transportation and communications links to the surrounding region. Some manufacturing remains in the city (Siemens and Schering are headquartered there, for instance). Items produced there include textiles, metals, clothing, porcelain and china, bicycles, and machinery. It is also a center for the production of food, chemicals, cigarettes, and confectionery. The service sectors have become the city’s economic mainstay. Research and development have gained significance, and Berlin now ranks among the top three innovative regions in the EU (after Baden-Württemberg and the Ile de France region). Fast-growing sectors are communications, life sciences, mobility and services with information and communication technologies, media and music, advertising and design, biotechnology and environmental services, transportation and medical engineering. Some notable companies with their headquarters in Berlin are Axel Springer AG, Deutsche Bahn, Bombardier Transportation, Universal Music Germany and Vattenfall Europe. 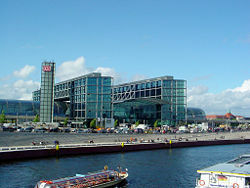 Berlin is among the top five congress cities in the world and is home to Europe's biggest convention center in the form of the Internationales Congress Centrum (ICC). It contributes to the rapidly increasing tourism sector encompassing 592 hotels with 90,700 beds and numbered 17.3 million overnight stays and 7.5 million hotel guests in 2007. Berlin has established itself as the third most visited city destination in the European Union. Public transport within Berlin is provided by the S-Bahn, which is a mostly overground urban railway system, and the U-Bahn, which is mainly underground. The Straßenbahn or tram (trolley) system operates almost exclusively in the eastern part of the city. Buses provide extensive service linking outlying districts with the city center and to the U-Bahn and S-Bahn. Almost all means of public transport (U- & S- Bahn, trams, buses and most ferries) can be accessed with the same ticket. Berlin has three commercial airports. 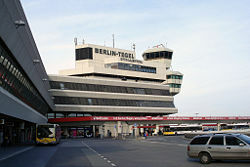 Tegel International Airport (TXL), Tempelhof International Airport (THF), and Schönefeld International Airport (SXF) handled a total of 18.5 million passengers in 2006 and served 155 destinations. With a population of close to 3.5 million, Berlin is the country's largest city. It is the second most populous city proper and the seventh most populous urban area in the European Union. Berlin has been a center for national and international immigration since the Edict of Potsdam in 1685. 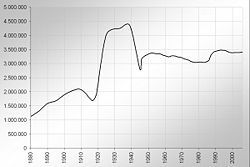 Waves of immigrants entered in the 1960s and 1970s, while in the 1990s the Aussiedlergesetze made immigration from the former Soviet Union possible. About 13.5 percent of the population are of foreign nationality, coming from 190 different countries. The largest groups of foreign nationals are those from Turkey, Poland, Serbia, Italy, Russia, France, Vietnam, the United States, Bosnia and Herzegovina, the United Kingdom, Croatia, and Israel. German is Germany's only official and most-widely spoken language. English is the most common foreign language and almost universally taught at the secondary level. About 20 percent consider themselves to be speakers of French, followed by speakers of Russian (18 percent), Italian (6.1 percent), and Spanish (5.6 percent). The largest religious groupings are: no religion - 60 percent, Evangelical - 23 percent, Roman Catholic - nine percent, Muslim - six percent, and Jewish - 0.4 percent. The city has four universities and numerous private, professional and technical colleges (Fachhochschulen), catering to approximately 130,000 students. The three largest universities are the Freie Universität Berlin (Free University of Berlin) with around 35,000 students, the Humboldt Universität zu Berlin with 35,000 students, and the Technische Universität Berlin with 30,000 students. The Universität der Künste has about 4,300 students. The city has a high concentration of research institutions, such as the Fraunhofer Society and the Max Planck Society, which are independent of, or only loosely connected to its universities. A total number of 62,000 scientists are working in research and development. The Staatsbibliothek zu Berlin is a major research library. There are 108 public libraries in the city. The Zoologischer Garten Berlin is the most visited zoo in Europe and presents the most diverse range of species in the world. Statue of Alexander von Humboldt outside the Humboldt University. Berlin is home to 153 museums, including the Altes Museum (Old Museum), which has the bust of Queen Nefertiti, the Pergamon Museum, the Bode Museum, the Jewish Museum, the German Museum of Technology in Kreuzberg, and the Humboldt Museum of Natural History, which has the largest mounted dinosaur in the world, and the best preserved specimen of an archaeopteryx. The Fernsehturm (TV tower) at Alexanderplatz in Mitte is the second highest building in the European Union at 1207 feet (368 meters). Built in 1969, it is visible throughout most of the central districts of Berlin. The city can be viewed from its 669-foot (204-meter) high observation floor. The Karl-Marx-Allee is an avenue lined by monumental residential buildings, designed in the Socialist Classicism Style of the Stalin era. Adjacent to this area is the Rotes Rathaus (Red City Hall), with its distinctive red-brick architecture. The previously built-up part in front of it is the Neptunbrunnen, a fountain featuring a mythological scene. The East Side Gallery is an open-air exhibition of art painted on the last existing portions of the Berlin Wall. The Brandenburg Gate is an iconic landmark of Berlin and Germany. The Reichstag building is the traditional seat of the German Parliament, renovated in the 1950s after severe World War II damage. The building features a glass dome over the session area, which allows free public access to the parliamentary proceedings and magnificent views of the city. Gendarmenmarkt, a neoclassical square dating to the Napoleonic occupation, is bordered by two similarly designed cathedrals, the French Cathedral with its observation platform, and the German Cathedral. The Konzerthaus (Concert Hall), home of the Berlin Symphony Orchestra, stands between the two cathedrals. Friedrichstraße was Berlin's legendary street during the Roaring Twenties. It combines twentieth century traditions with the modern architecture of today's Berlin. The Kulturforum, which houses the Gemäldegalerie, is flanked by the Neue Nationalgalerie and the Philharmonic. The Memorial to the Murdered Jews of Europe, a Holocaust memorial, is situated to the north. The area around Hackescher Markt has countless clothing outlets, clubs, bars, and galleries. This includes the Hackesche Höfe, a conglomeration of buildings around several courtyards, reconstructed around 1996. Oranienburger Straße and the nearby New Synagogue were the center of Jewish culture before 1933. The Straße des 17. Juni, connecting the Brandenburg Gate and Ernst-Reuter-Platz, commemorates the uprisings in East Berlin of June 17, 1953. Approximately half-way from the Brandenburg Gate is the Großer Stern, a circular traffic island on which the Siegessäule (Victory Column) is situated. This monument, built to commemorate Prussia's victories, was relocated 1938–39 from its previous position in front of the Reichstag. The site is annually used as the center stage for the Love Parade. The Rathaus Schöneberg, where John F. Kennedy made his famous "Ich bin ein Berliner!" speech, is situated in Tempelhof-Schöneberg. The Kurfürstendamm is home to some of Berlin's luxurious stores with the Kaiser Wilhelm Memorial Church at its eastern end on Breitscheidplatz. The church was destroyed in World War II and left in ruins. Berlin has a diverse and vibrant nightlife scene. Many buildings in the former city center of East Berlin became home to nightclubs, including Kunst Haus Tacheles, techno clubs Tresor, WMF, Ufo, E-Werk, the infamous Kitkatclub and Berghain. The Linientreu is known for techno music, and the LaBelle discotheque in Friedenau was the location of the 1986 Berlin discotheque bombing. The Karneval der Kulturen, a multi-ethnic street parade, takes place every Pentecost weekend, and the Christopher Street Day, which is Central Europe's largest gay-lesbian pride event, takes place on the last weekend of June. Berlin is well known for the techno carnival Love Parade and the cultural festival Berliner Festspiele, which include the jazz festival JazzFest Berlin. Berlin is home to more than 50 theaters, has three opera houses, and seven symphony orchestras, including the Berlin Philharmonic Orchestra. Berlin, the capital city of reunited Germany, is a young city by European standards, although it has had an impressive history since the ninth century, when "Berolina" was a small town on a trade route. Berlin is a center in European politics, culture, media, and science. The metropolis is home to world-renowned universities, research institutes, sporting events, orchestras, museums and personalities. The city suffered economically during the Cold War, when West Berlin was isolated and East Berlin suffered from poor economic decisions made by East Germany’s socialist central planners. After reunification in 1990, the industrial base of former East Berlin decreased, leading to high unemployment and stagnant GDP growth rates until 2005. The arrival of the federal government in 1999 brought some economic stimulus to Berlin. Berlin’s service sectors have also benefited from improved transportation and communications links to the surrounding region. The service sectors have become the city’s economic mainstay. Research and development have gained significance, and Berlin now ranks among the top three innovative regions in the European Union. Fast-growing sectors are communications, life sciences, mobility and services with information and communication technologies, media and music, advertising and design, biotechnology and environmental services, transportation and medical engineering. 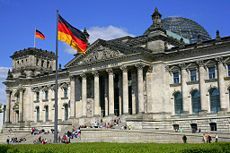 As capital of affluent and technologically powerful Germany, the economy of which is the fifth largest in the world, and with Cold War issues in the past, Berlin can be expected to prosper. ↑ Bevölkerungsstand in Berlin am 31. Oktober 2011 nach Bezirken (in German). Amt für Statistik Berlin-Brandenburg (31 October 2011). Retrieved March 16, 2012. ↑ BBC News. October 2, 2007. Eurozone jobless marks record low Retrieved July 31, 2008. This page was last modified on 15 December 2016, at 16:00.